Mrs Rodgers was invited to speak to a group of teachers at a conference in Wrexham to explain the benefits of being involved in a Comenius project. Dave Pheonix who helps schools in North East Wales to make links abroad, introduced and welcomed Mrs Rodgers and the girls who had taken part in the Munich visit. The highlights of the presentation were the musical items and Welsh poems which were performed to an excellent standard by the girls. Many of the teachers present passed on thier appreciation and thanks. 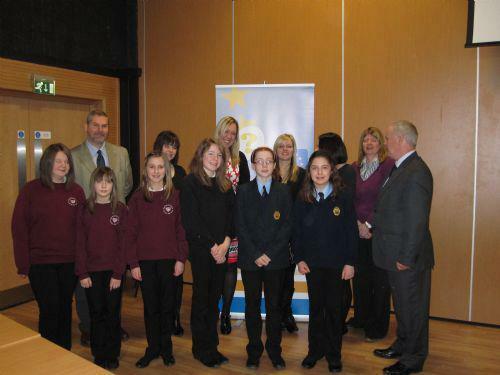 Listening to the experiences of pupils brings projects such as Comenius to life. Hopefully some other teachers will be inspired to take thier pupils abroad. The girls were a credit to themselves and thier families - thank you Amy, Laura, Lauren, Cordelia, Emily and Cheryl. We are looking forward to the World Tour of what is a very polished and professional performance! Thanks to Mrs Harcourt her help on the day and extra thanks to Mrs Palmley-Graham for coaching the girls to such a high standard. Meeting with dignitaires r'epresenting: 'NE Wales Forum for ESDGC', 'Europe Direct' and the 'British Council'.